Bootleg Canyon is nestled between Sin City and the Hoover Dam. Not quite a desert gem, Bootleg features over 33 miles of singletrack. Don't forget to pack a lot of water and sunscreen! 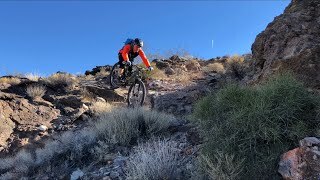 Whether you're there for OutDoor Demo or just to get away from the strip, start your ride at the multiple parking lots just south of the canyon. For a longer ride with some technical challenge and worthwhile views, hit the Railroad Pass Loop. For something a little more civil, try Par None/IMBA/POW. Both are perfect for an XC demo bike. If riding Bootleg for OutDoor Demo, be sure to register for the Bootleg Challenge on Skyline trail! Perfect place to test your downhill specific demo. Mostly Dry - It rained pretty good the night before we rode the Sh*t. The terrain is so rocky, it drains away any water. Fun trail. way better built than the Sh*t we ride in Taos. Don’t look to the right!